This afternoon, I got to work with one of our third-grade teachers as her students work their way through the first week of their opinion writing unit. I committed to working with a group of struggling writers for a few days in a row in an effort to jump start them. We'll see how that goes... Admittedly, this work is a deviation from the usual choice and independence that we strive for in writing workshops, but we are experimenting with gradual release of writers who tend not to produce too much. Yesterday, the five of us (the four students and I) thought of various ideas around what they might want to change, and we tried to write a collaborative piece about having a classroom pet. This didn't go so well. They each took different reasons to work on, reasons that we had thought up together, but... J. wrote almost nothing, M. wrote very little, and P. struggled because he didn't think that we should have a pet in the classroom. T. wrote a lot, but some of his work lost focus. Because I wanted them to feel like they accomplished something big, I combined their work and made copies for each of them. They were a little miffed that the pencil didn't show up on the copies, and they were also wishing that they had written more. "Don't worry," I said. "We will have another chance to write a piece together today." Today, we wrote about why they love their teacher, and their responses were heartwarming. Sometimes, we can write opinion pieces to celebrate something, and they were so happy to do this! They were much more inspired by this topic than by trying to talk their teacher into a pet. I first had them give me a bunch of ideas about why they liked their teacher, and I wrote their reasons, memories, stories, and examples on Post-its. They discovered that the reasons, the examples, and the stories sort of "team up," and the Post-its allowed us to move ideas around into groupings. Once we sorted the Post-its, we worked on balancing the piles a little--making sure that there were enough examples and details for each of the reasons. With minimal debate, each of the four students committed to write each of the four piles. I worked on having them verbalize what they were going to write until T. and J. were basically bursting. M. was VERY worried by spelling. The permanence of the pen was a little debilitating to her at first, but once she got going and let go of the concept of perfect spelling, she got a fair amount written. We did not touch on introduction or conclusion, but we’ll get there. For right now, just grouping like information and including details to develop their ideas was enough. Tomorrow, I’m thinking we will write about one of their essential teachers, working through the same process but more quickly, trying to get to the concept of introducing and concluding statements. Ultimately, I want them to take the confidence they're gaining as writers and transfer the skills they are practicing to topics of their own choosing and pieces that they plan and write on their own. others are reading and recommending each Monday, or to participate, be sure to head over to these blogs. Unfortunately, the chapter book I was planning to share this week was not a book that I enjoyed enough to share with this community. 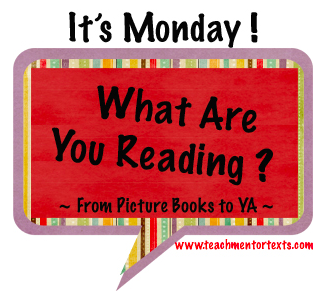 I prefer to say nothing if I can't say much nice, so this week, I will only be sharing a couple of picture books. 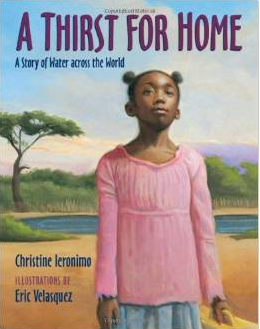 A Thirst for Home by Christine Ieronimo caught me by surprise with its emotional impact. While this book definitely highlights the struggles that people have in our world to obtain clear water, it also deals with the painful choices that families and parents have to make in order to survive. With beautiful language and imagery--"the sun was always smiling down on me and whispered my name with its hot, sticky breath--Christine Ieronimo introduces readers to Ethiopia, and then with painful images, she writes about the loss and separation: "Emaye cried, and her tears were like raindrops so precious that I tried to collect them with the scarf she gave me." 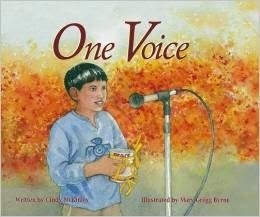 This book is another resource for building empathy, global awareness, and personal responsibility in elementary students. Coming Home by Greg Ruth also surprised me. 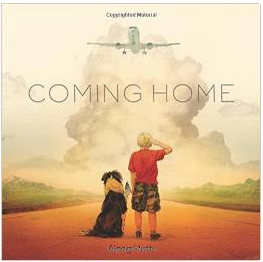 From the cover, I assumed that it would be about a parent coming home from serving, but it's almost a wordless picture book and a beautiful tribute to people who serve our country and people who wait for their return. The pictures are incredibly powerful and full of details, each one with layers of stories. I could imagine some really sophisticated conversations coming out of this book. Yesterday was a day off from school. I woke up, read a book, wrote two posts, and read a few blogs. Then, I got up, did some laundry, returned a couple of phone calls, and paid some bills. I even write some notes I'd been meaning to write before ten in the morning. Sounds pretty productive, right? Full disclaimer: my productivity was a complete exercise in task avoidance. I was avoiding the hard part in the book I am writing. Somehow, being busy, even just looking busy made me feel more justified in not sitting down in front of the computer and writing. that. chapter. I reminded myself of some of the students I watch in workshop. The ones who sharpen their pencil. Who get a drink of water. Who go to the bathroom. Who spend all their time looking for that perfect mentor text. They look so busy, but somehow manage to write very little. Isn't it so much easier to find other things to do--even important things to do--when the thing you are supposed to be doing is hard? My aha moment, writing about myself struggling to write the chapter I'd been avoiding, involves my 2015 One Little Word, acknowledge. Sometimes the work that we want to get done is the hardest to get started. Maybe if I acknowledge this fact for myself, the next time I sit at this computer will be to write the next hard section. One Voice by Cindy McKinley is the sequel to One Smile. If you haven't read her first book, One Smile, it is about a little girl named Katie who smiles at a man, who is sitting on a bench, on the way to her bus. Her smile inspires the man to smile at someone else and the pattern continues throughout the story until the smile circles back to Katie at the end It is a great story of how one smile can pass onto someone else and make their day a little brighter. 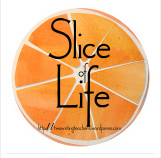 One Voice is another circle story about the concept of "pay it forward" and how one kind act can lead to another. In this story, a young boy's act of kindness creates a chain reaction of kindness. Each kind act inspires the person to do something kind for someone else until it circles back to the young boy, Jacob, at the end of the story. This is another great story to read aloud to students to discuss the power of small acts of kindness whether it be a simple smile or a gesture. During our math units, we try to provide students with real life problems to practice math concepts to see how the skills apply to daily life. This year, I have many students in my class who are sports fans so I wanted to try to find examples of word problems that revolved around sports. 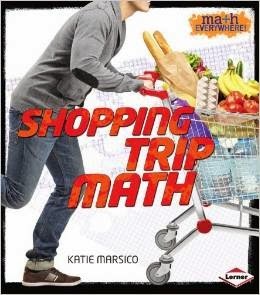 During my search on Amazon, I discovered the Math Everywhere series by Katie Marsico . 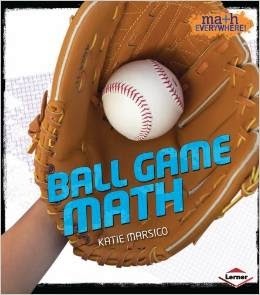 In this series, there are four books: Ball Game Math, Shopping Trip Math, Kitchen Math , and Math on the Move. In each book, there are a variety of multi-step word problems that revolve around one category such as sports, shopping, baking/cooking. There are answer keys in the back of each book that not only provide the answers, but also explain the steps taken to arrive at the solution. I envision using the problems in these books in a variety of ways: daily challenges, weekly challenges, problem of the day, group or partner problem-solving, etc. I think it is so important for us to provide students with real life applications in math and this series definitely helps us do that! 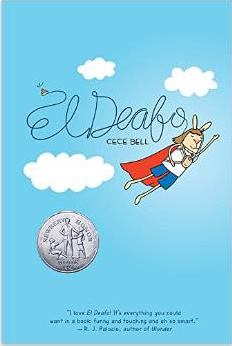 When I ordered El Deafo by Cece Bell, I didn't realize it is a graphic novel. I usually don't like graphic novels, so I almost returned it. However, so many people have raved about El Deafo that I decided to keep it, and I'm glad I did. The fact that the main character is a rabbit is another potential stumbling block for me in this book, as I generally prefer books with people, but Cece is a pretty human-like bunny. She relays her hopes and struggles with honesty, insight, and humor. Additionally, she teaches readers about the reasons for deafness, the struggles of deaf people, and the different ways deaf people are able to communicate. I laughed at loud at some of her adventures as she learned to lip read, and I completely understood her aversion to American sign language. I'm not sure how effective it is to use graphic novels as read-alouds--has anyone tried it?--but this book would be a great book club title to use in a character or social issues unit. Talking about El Deafo would lead to conversations about empathy, friendship, perceptions and realities, as well as learning differences and disabilities. On a different reading note, I have to give a shout-out to The End of Your Life Book Club by Will Schwalbe. An incredible reader recommended it to me so strongly that I ordered it that night. A memoir, written to honor a mother's well-lived life, this book is full of great books, wise words, humor, and important insights about how to lead meaningful, fulfilling lives. As we get closer and closer to the administration of the SBAC in our district, many teachers are asking about how to get their students ready for this assessment. I have been collecting ideas and resources for our teachers, as well as helping them realize that all of their instruction, all of our curriculum will help students be ready for this assessment. You don't study for it. You don't "prep" for it. You have good, engaging, purposeful instruction and learning happening in classrooms throughout the year. 1. 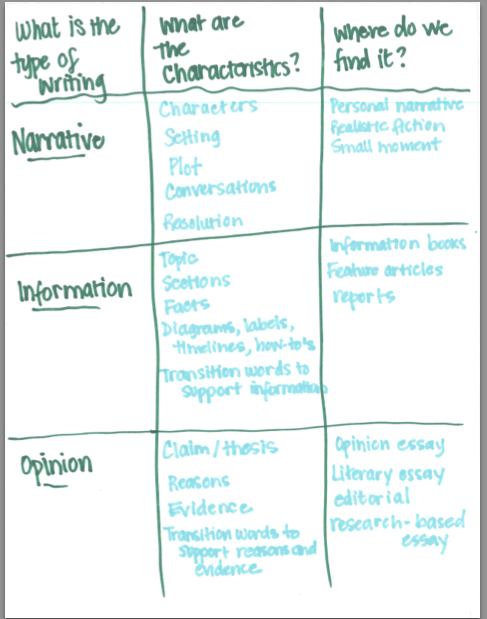 Make sure your students understand that we can categorize writing genres into three types of writing. I wrote about this in another post , but have developed another chart about this, as well. This chart that I am sharing is one that I developed in a flipped lesson. (I'm not confident enough to link the video, but I would share it with anyone who wants to send me their email for it...) I could picture developing this chart with or in front of students. They need to know that they already know this information. I think that it's important to also emphasize to students that these types of writing should not be pure. Stories contain opinions and information. Information contains opinions and stories. Opinions contain stories and information. 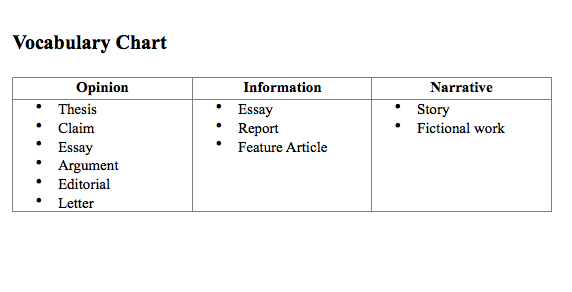 However, it's helpful for all of us to learn the characteristics of writing types by categorizing them. 2. I have many teachers ask me about the vocabulary they should be using. The more that we can use different terms with students, the better, not only for the SBAC, but also for life. A thesis and a claim can usually be used synonymously. If you google what the difference is, you might be inspired to write a blog post about just that. (I might do that later this afternoon...) A feature article is almost always informative in nature. This chart is a useful one to help students realize how much of what they will be asked to do on the SBAC, they are already doing. It's also helpful for teachers to see how much they are already teaching. 3. Teach the basic prompts for the three types of writing. The directions for the SBAC are complex and overwhelming. The directions, in and of themselves, are an exercise in close reading. Writing Pathways (Heinemann Press) contains basic prompts for each type of writing with quick descriptors of them. Give students exposure to basic prompts of the three types of writing so that they can flex quickly among them. They will feel better if they know right away how to tackle planning for any of the genres. 4. Give students as many opportunities to compose on the keyboard as possible. Typing stories they have already written is a very different skill. Yes, that might help them with their keyboarding speed, but they need to be able to think and write from their brains to their fingertips. I know that this won't be everyone's favorite post to read, and it hasn't been my favorite post to write. That being said, we can give students a few strategies so that when they see these assessments, they feel prepared and confident. One of the challenges of my year is rethinking and redeveloping our grammar curriculum. I have read many great books on the subject--The Power of Grammar and Grammar Matters remain at the top of my list for anyone looking for elementary-geared recommendations-and yesterday, with the snow storm, I started writing some of the lessons we will fold into units. As I watched the UConn women play South Carolina (Go UConn! --they won, if anyone is interested), I perused websites for grammar games. My twelve year-old snuggled into me and coached me through a battleship game at http://www.quia.com/ba/144044.html?AP_rand=604647634. It definitely kept our attention and we had to practice our subject-verb agreement. We also went on a treasure hunt at http://www.bbc.co.uk/skillswise/game/en30stru-game-verb-subject-treasure-hunt. This website has many interactive games to capture the gaming spirits, and Cecily paid more attention to finding treasure than the layups and three-pointers happening on the television set. Cecily was less interested in the extensive array of lessons offered at learnzillion.com. I knew that learnzillion offered great math lessons, but I was not as aware of the resources available for writing and language. Wow! If you haven't registered, I highly recommend doing so and allotting time for exploration. Play is such an important part of learning, and we have so many resources available during this age of access! The #caedchat was all about play last week--if you have time, read some of the tweets about the definition of play and the importance of it for learning. Also, don't miss Julieanne's post about the importance of play in lives and learning. Nothing like a snow day to inspire snuggling up with a book. I know that I will be unhappy in June, but this morning, being able to stay in bed and read Fish in a Tree by Lynda Mullaly Hunt felt pretty decadent. Mel Swider wrote about this book in her post about Growth Mindset. She was lucky enough to read an ARC copy of it a while ago. The rest of us can buy it now, as this long awaited book was released on February 5, 2015. Ally, a sixth-grader, has moved around a lot and has managed to hide her difficulties with reading. However, her new teacher, Mr. Daniels who reminds me of Mr. Falker in Patricia Palacco's Thank you, Mr. Falker (these two books would make a wonderful pairing! ), picks right up on Ally's struggles. He not only helps her learn to he read, but he also helps her recognize and value her strengths, educating the entire class about dyslexia. Reading this book as a class read aloud would inspire many questions and conversations about learning difficulties that could lead to greater understanding, acceptance, and appreciation of the assorted intelligences we all have. 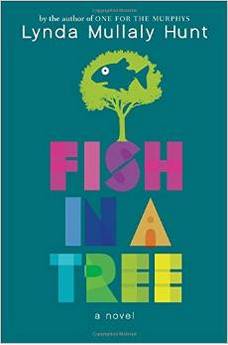 The lessons, messages, and themes in Fish in a Tree go much further, though. The text is simple, but the conversations and insights about human behavior are complex. "to be careful with eggs and words, because neither can ever be fixed." (p. 185, ARC copy) I can't wait to use this line, as it is not one that I've heard before! I came away from NCTE with many lasting impressions, and one of them has been about how to teach students the structure of an essay. I work with elementary teachers. Their students are just learning how to develop an essay. Our curriculum pushed teachers in the direction of five paragraph essays--an introduction, three body paragraphs, and a conclusion. The structure is predictable, even formulaic, and gives young students a scaffold for their claims, reasons, ideas, and evidence. Over the NCTE weekend, I had many conversations about essays. Have we demolished the beauty of essay with a simplistic hamburger template? You know the one--a top bun for the introduction, the cheese, tomato and meat for the body paragraphs, and the bottom bun for the conclusion... During a wonderful NCTE14 presentation, Embracing Complexity, Katherine Bomer reminded us that Michel de Montaigne invented this genre of writing as a way to push off depression and that essai means trials and attempts. It's more about errors and trials by fire. Have we forgotten that an essay should really be a journey of thought and an exploration of ideas? 1. Once they have an understanding of essay structure, teach into the power of intentional paragraphing. 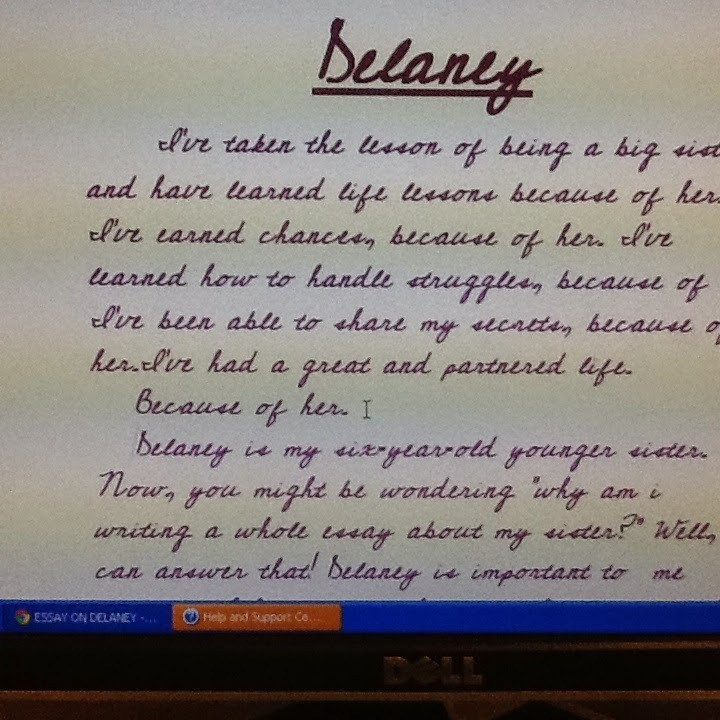 This essay, Delaney, is an older sister's tribute to her younger sister. When I sat down with this child, I complimented her tight organization. I also complimented the parallel structure she used. How many fourth-graders understand the power of repetition? I've earned chances, because of her. I've learned how to handle struggles, because of the. I've been able to share my secrets, because of her. I've had a great and partnered life. Because of her. WOW! This child understands the power of repetition, commas, fragments...I took it one step further and showed her a mentor text that had just a one sentence paragraph. "You can do that?" she asked. "Why couldn't you?" I asked. "Because paragraphs are supposed to have more than one sentence." Exactly. And because she knew the rule, I was comfortable teaching her to break the rule. "If you wanted one part of this paragraph to really jump of the page and stop your reader, what would it be?" I asked her. "Because of her." She didn't even have to think about her answer. She made those three words their own paragraph, and read the difference for yourself. These phrases lead to deeper thinking that sometimes, the organizational structure of the five paragraph essay restricts. If an essay is really an exploration of an idea, these thinking stems may lead to a-ha moments for students. If an essayist gets to say, "Wow, I didn't think of that before!" that's exciting! Some of the difficult decisions that teachers must make involve when to remove rules. These decisions cut across subjects. When do we know that students understand the mathematical rationale behind a problem so that they no longer have to explain every step of their thinking? When do they understand sentence structure enough so that we can teach them the power of sentence fragments or run-ons? When do they automatically make inferences, develop theories, and visualize what they read so that they no longer need to jot and track their thinking while they read? As with so much new learning, we have to master rules before we break them, but be on the hunt for the students who have mastered the structure enough to digress. Then, their writing can really gain power! Two months ago, coming home from the headiness of NCTE, I initiated Five Minute Writes at our dinner table, writing about it here. Basketball season and the other pressures of life with a seven-person household definitely get in the way of this becoming a daily practice. However, whenever we can, we write. My high school junior doesn't stare at the blank page as much. She still rolls her eyes and she still complains about needing to do her homework, but she gets started much more quickly. Even though she rarely shares her work, she leaves her notebook on the table with the pen still marking her spot. I think she knows (wants?) that I read her pieces, and she has a definite theme that has emerged. My high school sophomore writes in all different voices for all different reasons. Songs, poems, arguments, lists, narratives...she has written them. 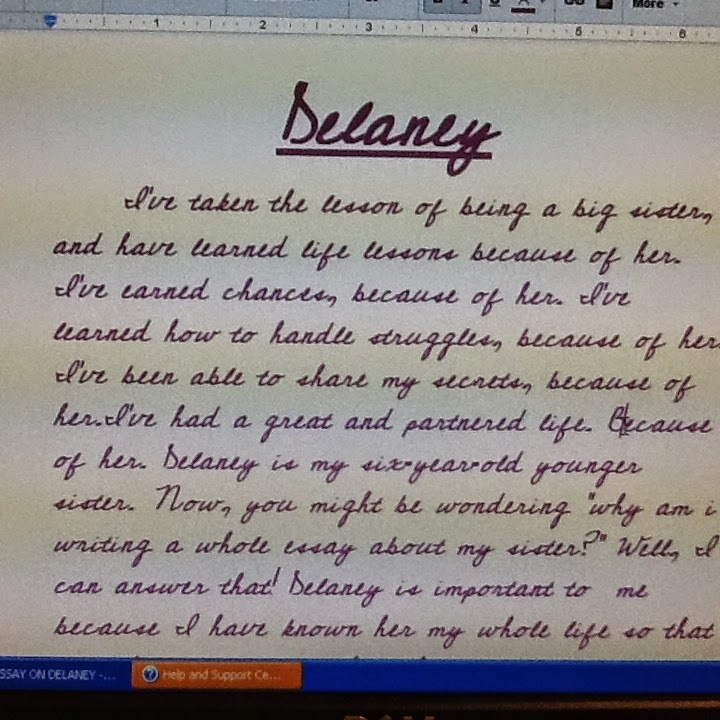 My seventh-grader has used her 5 minute writes as launching pads for bigger pieces of work. I LOVE that! Dear,Mrs._____ .Thank you for being a good teacher to me and having my back and helping me on my work,trying to challenge me on a lot of things so i can go to the next level.When i was in 5 grade we got along with each other and we used to make jokes. but when it was time to start 6th grade i wanted you because i knew you could help me on my work. Last Sunday my Father called my mom and said he wanted to talk to me. When my mom gave me the phone he said that he got new car.Also he said he has two jobs now to support me when i see him at his new house.My father got the 2015 cadillac,and a new pet.He got a lizard that has spikes on the side of his body all the way to his tail.I told my dad congrats on his car and pet i also said i love him and that i like how he is approving a lot of goals that he told me.So now im proud of my Father. Okay, I got a little teary here. We have so much power when we write. I love sharing it with the people around me. 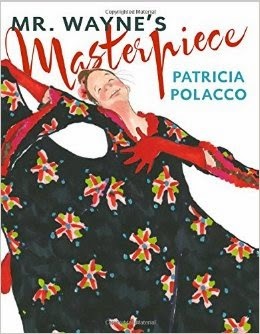 I love all of Patricia Polacco's books so I was excited to read Mr. Wayne's Masterpiece. This book reminded me of Thank You, Mr. Falker as it is also a true story about Patricia Polacco's experience as a student. In this book, she is trying to overcome her fear of public speaking and Mr. Wayne, a teacher, discovers a way to help her just like Mr. Falker helped her with reading. It is a touching story that so many students will be able to relate to because public speaking is a common fear, especially as a child. I love how Patricia Polacco shares positive school memories through her books of how teachers helped her overcome challenges as a learner. This story will lead to great conversations about overcoming fears, encouraging others, having empathy, and also having a growth mindset. This is a great story to share with students of all ages! 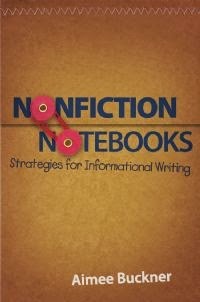 I loved reading Notebook Know-How: Strategies for the Writer's Notebook and Notebook Connections: Strategies for the Reader's Notebook by Aimee Buckner so I was excited to read Nonfiction Notebooks: Strategies for Informational Writing. This professional book was a very helpful tool to use when planning my informational writing lessons this year. It is full of strategies and student examples. If you are teaching informational writing, I would definitely check this professional resource out! 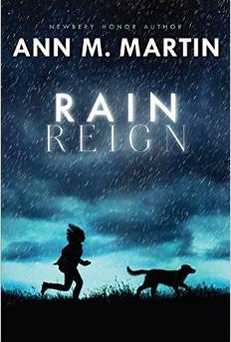 If Rain Reign by Ann Martin is not on your TBR or ABR (already been read) pile, then it should be. Melanie Swider reviewed it before it was published here--it was one of those books that I've been meaning to read for a while. I miss Rose, the main character. I miss her rule-bound way of seeing the world and her obsession with homonyms. I have even found myself looking for words that sound the same and thinking about the lists I could make. Ann Martin weaves social issues, ethical dilemmas, and natural disasters to create a book that leaves readers debating the decisions that many of the characters make. There are complex issues with complex background stories that would lend themselves to an amazing read-aloud for an upper elementary class. 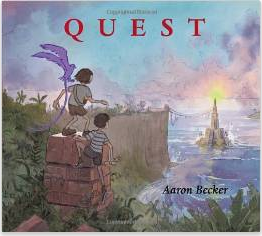 Quest by Aaron Becker is a wordless picture book that inspires lots of conversation and story telling. I love using wordless picture books to spark children's imagination and inspire them to study art. My twelve year-old and I had a wonderful time examining the pictures and formulating the story line. It would be fun to contrast the stories that younger children would concoct to the stories that older children would develop around the beautiful pictures. 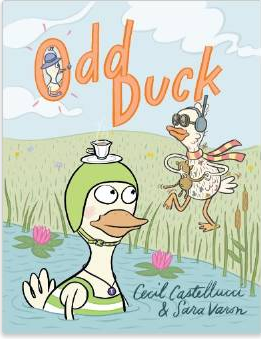 Odd Duck by Cecil Castellucci was front and center on one of our library shelves, so I picked it up. Right from the first page, I enjoyed several chuckles. Theodora is a rigid duck who meets Chad, a duck prototype of a hippie. Through humor, speech bubbles, subtle pictures, and understatement, readers watch the two ducks become friends but struggle with misinterpretations and miscommunications. This is a wonderful book to begin conversations about perceptions and realities, acceptance and forgiveness, and self-awareness and empathy. It's funny, but full of important messages about life. 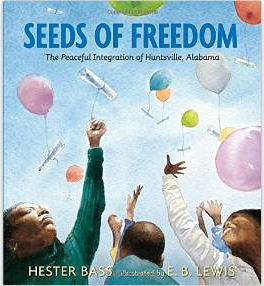 Seeds of Freedom by Hester Bass covers some of the events in the Civil Rights movement. Even though it's a long picture book, it will inspire a lot of wondering and researchable questions. Because of the references to segregation, school integration, and peaceful protests, this book could also be a springboard to conversations about empathy, dignity, civic responsibility, and individual power.